Sports never takes off on Thanksgiving. 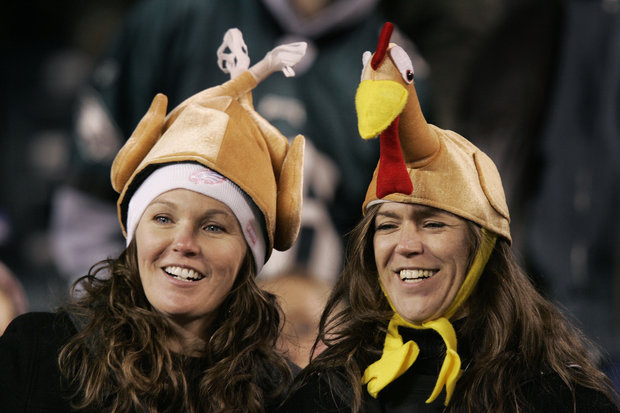 Sports fans enjoy the NFL on Thanksgiving. Sports never take a holiday: People race in turkey trots, watch the NFL, and some even go bowling on Thanksgiving. When I worked at an all-sports radio station, I was sent to Detroit to cover the Bears on Thanksgiving Day. Fortunately, Detroit isn&apos;t a long flight; you fly in early, cover the game and return home after you finish up locker room interviews. The Lions provided us with a full Thanksgiving dinner in the press room that year. Glamorous, the life a traveling sports reporter. Thankfully, by my choice, those days are behind me now. Call me a softie, but family time matters to me. Thanksgiving and other holidays also matter to athletes, even though many leagues schedule practice, travel or games that day. I talked to some of Chicago&apos;s athletes about the upcoming holiday earlier this week. The Bulls, nearing the end of their five-game road trip, are in Houston Wednesday night and will fly back home for Thanksgiving Thursday. Players are probably hoping coach Tom Thibodeau will give them a day off before they finish the trip in Milwaukee on Saturday. Bears head coach Lovie Smith usually completes practice by 2 p.m., allowing players some time to celebrate. Bulls guard Kirk Hinrich gets one extra advantage this Thanksgiving: he never sold his home here. Returning as he did, now he gets to enjoy the comforts of home with his family, including his wife and two daughters. Meanwhile, 19-year-old Bulls rookie Marquis Teague said he hopes Mom, Dad, his sisters and his oldest brother will be here for Thanksgiving. Can you imagine being that age and not having your family around? And Bears safety Anthony Walters told me that when he was a rookie last season, Major Wright invited him to spend the holiday with Wright’s family. That is generally what teammates do for the younger players. Bears linebacker Nick Roach and his family “cram” into his grandmother’s house for a huge feast. While his uncles and brother enjoys watching football, oddly enough, that isn’t a must for him. Roach put the holiday, and its real relationship to football, into perspective: “You are thankful for the God-given abilities and talents, to be able to play the game that you love and be able to do it for a living, to have platform to a be a good example for those that follow you." "And I am thankful for my family,” Roach added. My gratitude extends to my family, friends and co-workers — everyday matters having them. While I enjoy covering sporting events, tomorrow is my personal sporting event: cooking a turkey and all the trimmings. I really love the left-overs, too.